Not exactly the preface I was expecting. 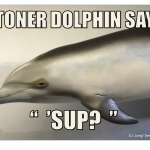 Despite popular notion, studying dolphins entails it’s fair share of frustrations. No one understands this better than Scripps Institute of Oceanography scientist and premier “waddy” wrangler, Tara Whitty. Dolphins are ready for their close up. Armed with her camera and clipboard, Tara scans the waters of Malampaya Sound for signs of her rather elusive study species. Unfortunately, the Irrawaddy’s ephemeral presence is most likely attributed to their ICUN designation rather than their secret plight to evade Tara’s ever-watchful eye. Though I can’t say that for sure. “Irrawaddy dolphins (Orcaella brevirostris) are a relatively little-studied species of dolphin distributed patchily around Southeast Asia. They occur in riverine, estuarine, and coastal habitats, which puts them in contact with a number of human activities. Though the species as a whole is listed as Vulnerable by the IUCN Red List, several subpopulations (i.e., geographically separated groups) are listed as Critically Endangered. Major threats include accidental entanglement in fishing gear, or “bycatch”, as well as habitat degradation (particularly for the riverine subpopulations), pollution, and boat traffic,” Tara explains in her research blog Of Dolphins & Fishers. As a conservation ecologist, Tara’s research with the Irrawaddy is critical in our greater understanding of these creatures, their role in the ecosystem, and what efforts we might take to recover their rapidly fleeting populations. Yet, the dolphins are merely players in a greater underlying narrative. Whether by tradition or necessity, many of the coastally developing nations that encapsulate the Irrawaddy’s home range continue to depend on small-scale and artisanal fisheries. Despite the fisheries being relatively low-tech, they are vital to the livelihood and food security of millions of people. Conversely, these fisheries exhibit the greatest threat to dwindling dolphin populations through accidental capture by fishing gear. Balancing the complicated interface between human well-being and charismatic animal conservation, dolphin bycatch presents a problem not easily remedied. Thus, Ms. Whitty has taken to the business of mapping conservation-scapes. Stepping back and looking at the whole picture, these conservation-scapes consider not only human impact on dolphins, but the social, cultural, and economic factors that drive human-dolphin interactions. Furthermore, her work examines the obstacles and opportunities that exist for fisheries management and marine conservation within these communities. Through extensive interviews with the local populace spanning her four study sites (Thailand, Indonesia, and two in the Philippines), Tara compares conservation-scapes across locales to better understand how management might be improved in these places. These household surveys cover topics ranging from fishing practices and local dolphin knowledge to perceptions of marine resource management and governance structure. Now, it would seem that such direct interactions would not bode well for “prying scientists,” however this did not appear to be the case for Tara and her team. When not being promised off to the locals, Tara and her interview crew continue to pinpoint potential pathways for improving conservation and fisheries management practices in these areas. With this goal, SAFRN, more formally know as the Small-scale and Artisanal Fisheries Research Network, was founded. So what does this all equate to? Does Tara’s research on the inter-tangled lives of humans and dolphins end in a happily-ever-after? Here are some thoughts that emerged from that process: This particular conservation issue (marine mammal bycatch in small-scale fisheries in developing countries) generally coexists with a suite of other issues that need to be addressed regardless of the charismatic animals, for environmental and social sustainability. Maybe we can’t save these dolphins, but “mapping conservations-capes” at these sites might be able to help improve future management of other issues related to ecosystem health and human well-being. For the dolphins and many cetaceans that roam this area, the future looks grim. However, Tara does not believe all is for naught. Many of these coastal communities are in desperate need of interdisciplinary data sets that take into consideration the ecosystem as a whole, humans included. Organizations such as SAFRN are needed to streamline this information, make it accessible, and ultimately, utilize this data in a way that implements sustainable solutions. The Irrawaddy are merely the sentinel species, forewarning us of impending danger, not only in Southeast Asia, but globally. Are we listening? Special thanks to Tara Whitty, for letting me tell this story for all of you here at Deep Sea News and for dealing with my many, many e-mails. Salamat. Share the post "The Plight of the Irrawaddy"
Very cool! An entertaining and eye-opening read!